How Far is Senthil Golden Gate II? Golden Gate II Apartments warmly welcomes you to experience a new level of living, in spaces designed exclusively for you. 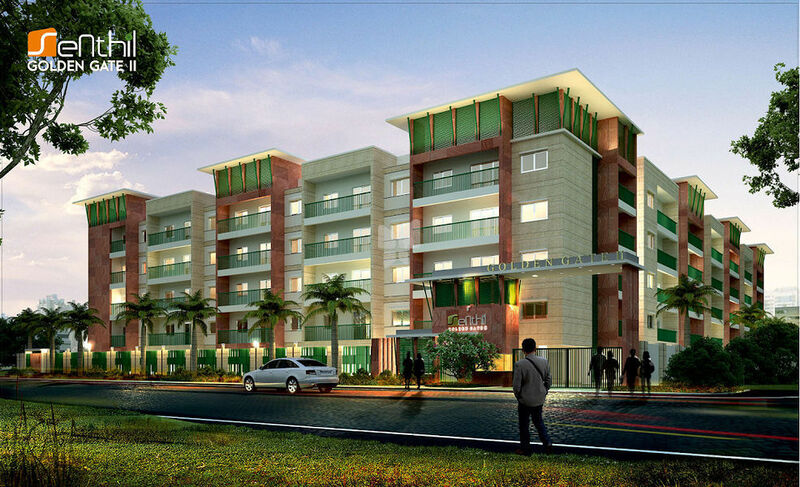 Located at Saravanampatti, Coimbatore's latest IT corridor, each of the 80 apartments has been thoughtfully designed to offer the most optimum utilization of the space called home. Recognizing the lifestyle demands of today's professional, Golden Gate II throws open a host of conveniences that ensure every comfort factor is taken care of. 9" brickwork for outerwalls and 4.5" brickwork for inner walls. Rooms: 2'x 2' Premium vitrified tiles of repute brand. Bathroom, Balcony & Utility Floor: Anti-skid ceramic tiles. Bathroom Walls: Designer tiles upto 7'0 height. Utility Walls: Tiles upto 3'0 height. Kitchen Platform: Granite table top and tiles 2'0" height above table top. Inside Walls: Two coats of putty, primer and roller finished with acrylic emulsion. Outside Walls: Exterior emulsion paint finish. Entrance Door: Teak wood frame and readymade paneled door, polish finished. Other Doors: Country wood frame and readymade paneled doors finished with enamel paint. 3 Phase Connection for each flat. ISI brand wires, DB and MCB. Modular switches. Power backup of 500 Watts for each flat. AC Provision in Master Bedroom. Heater provision in toilets. Telephone provision in Living Room. Intercom connectivity with Security Room. ISI brand PVC, UPVC and CPVC pipes. Sanitary fittings (White Color) and CP fittings of repute brand. Counter Top wash basins. Wall Mounting EWC. SS Sink in Kitchen and Utility. Aquaguard provision in Kitchen.